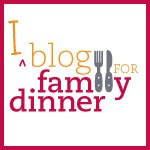 This month, Blog for Family Dinner founders will reflect back on some lessons learned from our B4FD guest bloggers over the past year. This week, I'm offering my reflections. Family dinner is a wonderful way for kids and families to stay connected; that's something we at B4FD talk about all the time. I believe that family dinner also has the potential to improve the broad health of society. Family dinner has been shown to be effective in addressing many health challenges ranging from childhood obesity to risky behaviors in teens to self-esteem issues to adolescent depression. Coming from a background in public health, that's one reason family dinner resonates with me. A positive health intervention that can change the lives of millions for little to no cost? Something that, once your family gets into the routine of it, can be fun, rewarding and good-for-you? Family dinner is the opposite of medicine, but it has the potential to bolster the health of our nation, especially our children. Yes, it's that important. ...it's often those memories of time at the table with my own family that keeps me motivated. In my gut, I know that people are more likely to have a healthier relationship with food if they spend time with it —preparing it, serving it, taking time to eat it (rather than just shoving it down from the drive thru). As it turns out, my instincts are backed by scientific research. A growing body of evidence shows that children who regularly eat meals with their family are less likely to be obese. In one major national study, 4-year-old children who ate dinner with their family six or seven days a week had a 25 percent lower risk of obesity compared to kids who ate dinner with their family less frequently. Other studies also have found that adolescents who regularly eat family meals are less likely to be obese. Today, Monday September 24, 2012, is also CASA's Family Day, established over a decade ago as a way to remind parents that family dinner was an effective way to stay connected with their kids. CASA research has shown many times over that frequent family dinners reduce the likelihood that teens will engage in risky behaviors, as well as improving family relationships and performance at school. CASA's Family Day is an important campaign we champion at B4FD, though we know reducing illegal drug and alcohol use among teens is just one of the important benefits of family dinner. Family meals can mean happier, healthier families and a healthier society as well, and that's something to celebrate!